Cayson Conner, guarded by Caldwell County’s Jada Boyd, recorded 14 points in the Lady Marshals 76-50 win. The Lady Marshals (7-1) opened play in their Lady Marshal Holiday Classic, tipping off in the first game Thursday against Caldwell County (5-2) and picked up their eighth win of the season by a final score of 76-50. Leading 5-0 early in the game, Caldwell County scored six straight to take over the lead at 6-5. A 3-pointer by Layne Pea put the Lady Marshals back up by two points, going on to lead 15-8 at the end of the first quarter. Presley Jezik dropping in one of three 3-pointers on her way to 10 points in the Lady Marshals Holiday Classic win. Caldwell County scored the first six points of the second quarter to pull to within one of the Lady Marshals before a basket by Whitnee Miller put the lead back to three. 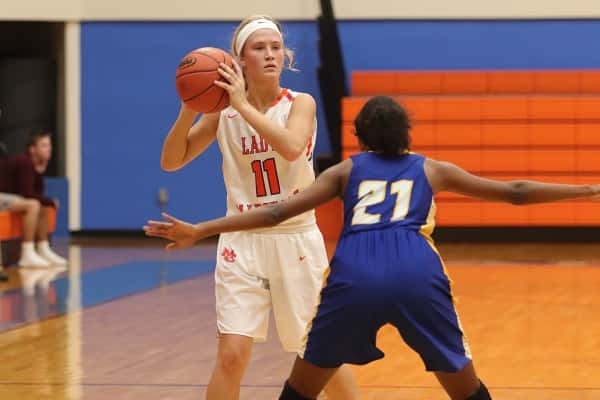 With a chance to stretch their lead, the Lady Marshals missed four straight from the free throw line, while the Lady Tigers took advantage and pulled back to within one point. Two straight threes by Presley Jezik stretched the lead back out to six points and four more from Halle Langhi and free throws from Lorin Powell put the Lady Marshals up by eight and they led by 10 at halftime. Caldwell County opened the second half with baskets by Bella McConnell and Jacey Jaggers to cut the lead to six. The combined scoring by of Jezik, Tera Colson, Cayson Conner and Miller led the Lady Marshals to a 59-43 lead at the end of the third quarter. 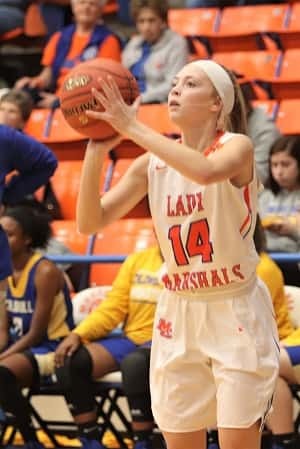 Holding Caldwell County to seven fourth quarter points, the Lady Marshals scored 17, led by Powell with six with scoring also coming from Pea, Conner, Colson and Langhi to win by 16. The Lady Marshals were led in the win by Conner, Langhi and Powell, all three with 14 points. Bella McConnell led Caldwell County with 15 points. The Lady Marshals will tip-off against Dyer County, TN at noon Friday. Carlisle County beat Washington County 62-52 in the second game Thursday, in the third game Henderson County beat58-42 Dyer County, TN., and in the final game between Graves County and Meade County, the Lady Eagles won 61-46.